Country villa with park and swimming pool, surrounded by greenery of Tuscany at 1km from Monterotondo M.mo, offers an exclusive and private environment. It can accommodate up to 14 guests and is divided into 2 apartments on 2 levels, adjoining but independent . The large outdoor areas: swimming pool, garden with barbecue and playground, they are for the exclusive use of our guests. It is ideal for families or couples who want to immerse themselves in nature, and then make a stop in the sights of Tuscany. The Villa, called from the very beginning "I Prati", is a typical Tuscan rural house that dates back to the eighteenth century, completely renovated with fireplaces, terracotta floors and exposed beams. It has a total of 4 double bedrooms and 1 bedroom with bunk beds, 3 baths, 2 living rooms, 2 kitchens, 4 terraces. It is divided into two apartments that can be rented separately. The largest apartment, located on the pool level, has a large living room with fireplace, kitchen, large bathroom, bedroom and small bedroom with bunk bed, 3 terraces; a stone staircase leads to the upper floor with two double bedrooms and a small bathroom; another stone staircase leads to the lower floor where there is the smallest apartment, featuring a large living room (with sofa bed), kitchen, a double bedroom, a small bathroom, separate entrance, terrace and outdoor spaces. 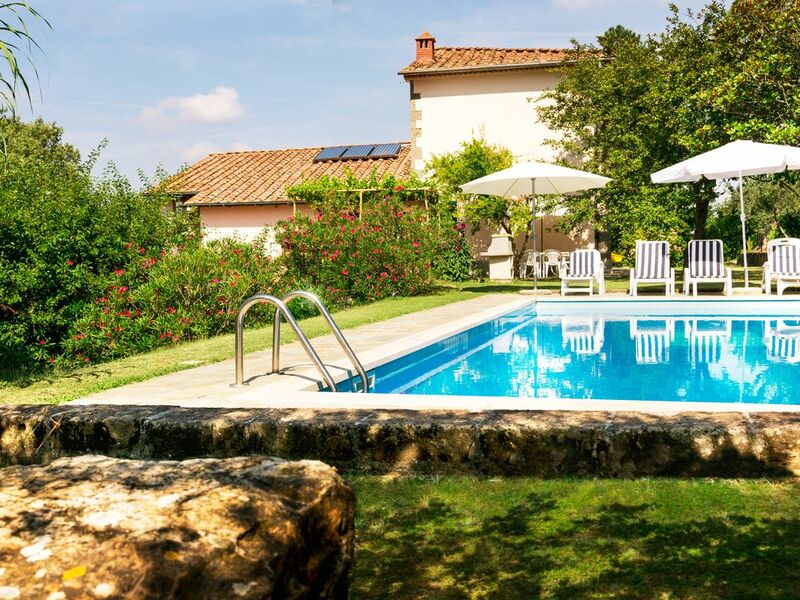 The pool, surrounded by oleander and rosemary bushes, is equipped with barbecue, deck chairs and umbrellas. The property, surrounded by six hectares of land between fields, olive groves, chestnut woods and Mediterranean bush, has a private access (gate with tree-lined avenue) for the exclusive use of our guests. Leonello and Agostina, who live within 3 km from “I Prati” Villa, will welcome you with sympathy and warmth and will be at your disposal for your every need. An old horse (Alcatraz) and 6 beloved cats live permanently at “I Prati” Villa. It is not difficult to meet the inhabitants of the forest: deer and wild boar. The Villa is located 1 km from Monterotondo Marittimo, a small medieval village that is located in the metalliferous hills setting 550 meters above sea level. The country is surrounded by the Mediterranean forest that stretches to the sea, rich in flora and fauna and by immense chestnut; it is the best destination for lovers of trekking walkers, healthy air and natural beauty., the Monterotondo area, famous for Soffioni Boraciferi and for the production of Geothermal energy, offers a truly unique natural spectacle in the "Biancane" Park one km far from the village. The surrounding area also has numerous thermal springs, such as the beach resort of Biolake in the nearby village of Sasso Pisano. Monterotondo Marittimo is an excellent starting point to visit some of the most beautiful towns of Tuscany and enjoy the sea of the famous Tyrrhenian coast is 20 minutes from the medieval village of Massa Marittima, 50 minutes from the Etruscan town of Volterra, 45 minutes from ' Gothic Abbey of San Galgano, 1 hour from Siena, a little over one hour and a half from Florence. The beach is easy to reach: 30 minutes from the seaside town of Follonica and Sterpaia Park, 45 minutes from the famous seaside resort of Punta Ala and Cala Violina beach, 40 minutes from the Bay of Baratti. What makes a truly unique experience of staying at “I Prati” Villa is waking up to the sound of birds, immersed in the colors and scents of nature still intact, isolated from roads and urban centers. The hillside location, and the presence, around the house, numerous shady trees, provide a cool environment even on the hottest days of summer. "Just wanted to let you know how happy we were with where we stayed. We really liked the feeling of being away from it all, but at the same time so close to things to do. We very much like Tuscany in any season and appreciate the warm hospitality and often spend our time there. We found Mr Bardelloni very obliging and helpful, for example we had specific requests (extra blankets etc.) and Mr Bardelloni did his best to meet every one. I have never had such a response from any other rented villa and as such Monterotondo will definitely be our first port of call when we can book another break again in the future - We really wanted to jump in that swimming pool so we will look forward to coming back in the summer." "Abbiamo trascorso una magnifica settimana in questo podere da sogno: tranquillità, benessere e relax sono garantiti. L''ospitalità dei padroni di casa è stata squisita, specie con i nostri bambini. Le foto non rendono giustizia alla casa e al parco che sono davvero molto belli e spaziosi. Contiamo di tornarci l''anno prossimo! Grazie!" "Maison très tranquille, idéale pour deux familles avec enfants"
"La casa è molto spaziosa e accogliente. Ideale per famiglie con bambini o per gruppi di amici. Il contesto esterno è altrettanto bello e la posizione è un ottimo punto di partenza per gite nell''entroterra nonchè per raggiungere la costa. I proprietari sono molto gentili e molto disponibili. Contiamo di tornarci quanto prima per goderci la bella piscina durante il periodo estivo." "casa davvero grande e ben strutturata (in tre nuclei familiari ci siamo stati benissimo! ), in mezzo alla natura (avete mai visto un istrice da vicino? noi adesso sì! ), vicino ad un paese con tutte le comodità (c'è una fornitissima coop! ), in un'area in cui si può spaziare dalle visite culturali (Massa Marittima), al mare (Baratti, Golfo di Follonica), a escursioni naturalistiche (oltre a boschi e colline, i fenomeni geotermici presenti un po' dappertutto negli immediati dintorni)." "Casa bella e spaziosissima in uno splendido contesto di natura e tranquillità.Da sottolineare l'ottima accoglienza e l'estrema disponibilità dei proprietari. Belli e curati gli spazi esterni, ricchi di fiori e vegetazione. Abbiamo trascorso veramente una splendida vacanza in un luogo immerso nella natura ma relativamente vicino al bel litorale e a molti centri di rilevante interesse storico artistico."